Virtual reality has been around for decades in various iterations but this is the first time it feels real enough to make a grown woman grimace with a memory long lost but alive again. Cardboard is so easy to figure out that its uses extend far past the daily pastiche of just hopping to Ecuador for an afternoon or cruising down to Bonnaroo in a convertible. Color shot of a young woman looking through a cardboard, a device with which one can experience virtual reality on a mobile phone. This is going to be the future. For a few years, rumblings of Google Cardboard have become increasingly louder to the point that the New York Times recently gave it away free in a Sunday edition. A blue-chip newspaper is casting a huge bet in predicting the next big trend and they're looking not to today but banking on the future in two, five, 10 years down the road, paved by a hopefully younger reader. Those younger eyes will the engage across generations with legacy readers and stay within the Times family across a diverse array of platforms -- it provides fantastic content too. There are few barriers to the technology, anyone that can download an app and put on a headset can take advantage of the simple instructions. When I gave it a run the first time around I was laughing out loud over how simple it is to visit Italy and walk through famous historic sites while traipsing around your house in boxers and sipping wine. Tech-heads are leading the way with this technology and making increasingly accessible and interesting apps but they're not the only ones. After a good five hours I handed it over to a woman in her 50s, who has been around the world in the fashion industry. Watching her smile light up within 10 seconds of seeing a street she had last walked down 30 years was one of the most powerful experiences I've had in the last five years. Virtual reality has been around for decades in various iterations but this is the first time it feels real enough to make a grown woman grimace with a memory long lost but alive again. Cardboard is so easy to figure out that its uses extend far past the daily pastiche of just hopping to Ecuador for an afternoon or cruising down to Bonnaroo in a convertible. The connection it makes to someone in her 50s is the fascination a five-year-old feels every day. This is possible now, just imagine what it will be like with smell replicators and neuroprosthetics in five -- 10 years. Tech-heads are leading the way with this technology and making increasingly accessible and interesting apps but they're not the only ones. Dynamic rap group Run The Jewels recently launched their new music video Crown, if you can call it that in the traditional sense, on the New York Times VR App. Ten dollars spent on a cardboard headset and pairing it with your headphones is a truly immersive experience. Aside from Android, Facebook is slowly rolling out in-browser 360 videos and photos -- Jerry Seinfeld riding around in a car was a recent hit and fantastic showing of how easy it is to adopt the technology. There have been a few truly disruptive social changes in the last number of years -- Instagram and Facebook are two monoliths that have changed the way people communicate online while Uber and Tesla aim to rip the last 100 years of North American cultural fabric in half within a decade. 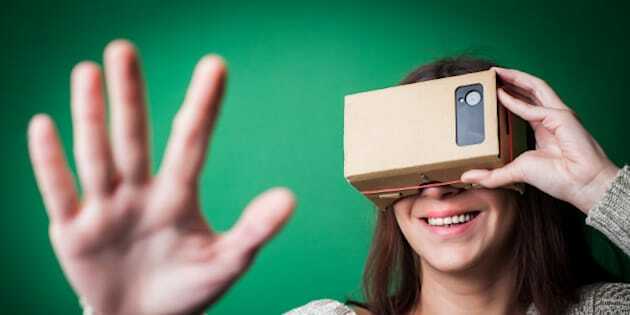 Cardboard and its brethren, Oculus and Vive, are at the forefront of humanity's next great disruptive change as 360 begins to extensively modify how we communicate with media and each other. This is the virtual reality we've all longed for since Tron in the 80s. The fanfare hasn't been huge yet but the application of immersive virtual, live and augmented realities will usher in the next human cultural shift and it will happen faster than expected -- this is here now.